"I know from your horoscope that gambling will bring you unhappiness." Taken from a story in the Indian epic The Mahābhārata, A Throw of Dice provides another piece of the larger puzzle of silent film, as it combines German and Indian forces to produce an entertaining romance with dashes of epic thrown in. Director Franz Osten and star Himansu Rai had already made two prior films together, long before Bollywood would become known around the world. The pair undertook a significant financial risk in making their films, as India was yet to become a filmmaking powerhouse, but they succeeded well enough here, in a lavish production. The story revolves around two kings, Sohan (Rai) and Ranjit (Charu Roy), cousins who each harbor inveterate gambing streaks. Sohan enlists a flunky to kill Ranjit, poisoning Ranjit with an arrow during a tiger hunt. Ranjit is taken to the home of a hermit (Sarada Gupta), who, it turns out, was a former tutor of Ranjit's. Ranjit's gambling turned off the hermit, who now lives with his daughter Sunita (Seeta Devi). The hermit's medicine allows Ranjit to recover, and the king falls in love with Sunita. The pair prepare to elope, but Sohan refuses to give up so easily, throwing further obstacles in the couple's way, including a fateful game of dice. The film proves to be quite entertaining, despite having a fairly spineless character in Ranjit as the romantic lead. Ranjit does almost nothing; he is more acted against than acting on his own behalf, as his eventual salvation is achieved largely because of a trusty servant, rather than his own initiative. The film makes more sense if one views the evil Sohan as the main character, doomed by lady luck, as it were, to fail in his biggest gamble of all. Osten makes the most of his exotic (at least to Western audiences of the time) locations, using thousands of extras, tigers, elephants, and more to create a epic feel. He doesn't opt for mere spectacle however, as those elements support the main story rather than serve to distract from it. He throws in nice touches than underline character, such as having a fawn play in the background of Sunita's room, showing her essential innocence. We also see that Sohan has a son that he dotes on, making him less of the sneeringly evil figure he might otherwise be, and more of a Machievellian figure doing what's necessary. Not that such behavior will is going to led to happiness in this film. One of the major factors in recommending the film is composer Nihit Sawhney's new score, which adds another level of lush beauty to the proceedings. Given the prevalence (and financially, it's completely understandable) to view silent films with piano accompaniment, it's always impressive how much difference a quality score played by a large orchestra can make. If the film itself were not enough to recommend this release, this factor should certainly urge you further to consider giving this release a look. Image Transfer Review: The film looks quite good overall, with few print defects to detract from the experience, but the transfer is somewhat problematic; I watched this once on a Playstation 3, where it looked smooth and clean, but another player displayed an excess of interlacing which made for a less than thrilling viewing experience. Your mileage may vary. Audio Transfer Review: The newly composed score by Nihil Sawhney is lush and attractive, giving the film a glossy, high class feel. Extras Review: The main extra is a lengthy interview with composer Sawhney (35m:12s), which covers most of what you would expect to hear in an interview like this, getting into how he got the job, his interest in silent film, and so on. A stills gallery is comprised of captures from the film rather than actual stills, so it's not of much interest. Finally, an insert essay by Bruce Bennett covers the backgrounds of Osten and Himansu Rai, telling the interesting story of how they worked together to create the film. 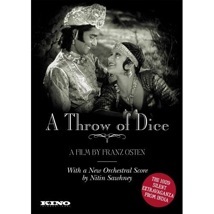 An attractive film of the late silent era, A Throw of Dice is also a part of early Indian film history as well. It should be of interest to silent film buffs, with its confident direction by Franz Osten, fine acting, and use of massive crowds and even elephants. The Kino DVD will either look fine or dismal, depending on your player.